We don't use fonts. Instead we use real person's handwriting for real results. Letters are now perfectly snapped, giving a natural and realistic handwritten look. A variety of styles to choose from, each representing different person's handwriting. invitation and even a sticky notes. 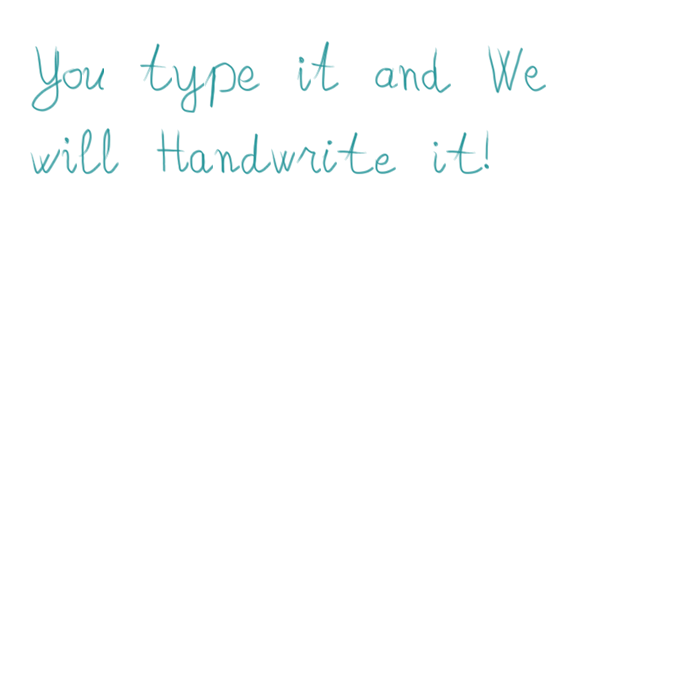 You type it and We will Handwrite it! Use the most creative ideas for increasing your sales and new customer acquisition. Send personalized handwritten letter to your clients and make them read and respond. Thanks to our technology you can order today, get it with the speed of light and lunch your direct mail campaign tomorrow. Contact us and we will be more than happy to generate as much as 25 letters for free to check our quality. Maximize the impact of your direct mail marketing campaign. It was never easier. Find the most suitable plan for your needs on our Pricing page, and send us request with details about your order through our order form. You will be contacted from our person very soon for with furder details and instructions for compleeting the order.